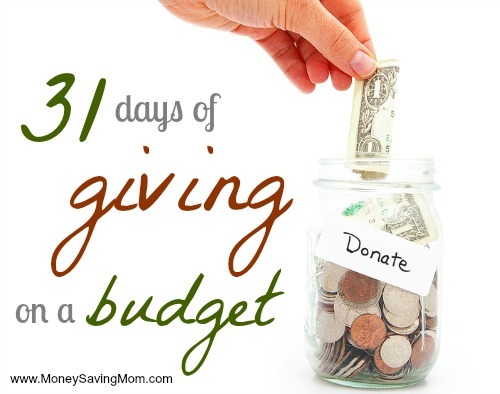 If you have a Giving on a Budget story to share of a way you or your family has given to others this year or this holiday season, please email me your story (or a link to your post on your blog) and a picture to go along with it, if possible. I’d love to hear it and possibly share it during this series! I love Christmas! I love the decorations, the music, the wrapping, the anticipation…I love it. What I don’t love? Clutter. So I love giving consumable gifts. It’s fun for children to have things to unwrap and it’s nice for me to know that once they’re gone, they’re gone. Another way I like to cut back on clutter and help my children learn a little about giving is through gifts of charitable donations. But how can we make this, well, more fun for our kids? How can we hold on to the joy and elation of surprise on Christmas morning while making the real gift something for others? Rather than purchasing a new or trendy game, pick up two copies of an old classic. Candy Land, Chutes & Ladders, Hi Ho Cherry-o, etc. often go on sale for $5 each during the holidays. Wrap them both together for your child to open and he gets to keep one, the other gets donated to a child in need. 2. Give a small toy that represents the charity. Want to give to an animal shelter? Wrap up a little stuffed dog or cat. Is this the year you donate to the March of Dimes? Give your child a small baby doll. Let your little one know that while she takes care of her new treasure, your donation will help take care of even more in need. 3. Give them a gift card. Children have amazingly giving spirits. They also love to get to choose things and to be “in charge”. Consider giving your child a ten or twenty dollar gift card to a local supermarket and letting them choose canned goods for a local food pantry. The adventure of getting to shop is as good as a new toy for many little ones! Those are my three favorite ways to keep Christmas clutter-free and encourage a giving heart all while making sure there’s something to open under the tree. Do you have any tricks for making charitable giving fun for children? JessieLeigh is the mother of a former 24-week micropreemie and two full-term blessings as well. She is a determined advocate for the tiniest of babies, including the unborn, and a firm believer in faith and miracles. She shares about raising such a precious, tiny baby over at Parenting the Tiniest of Miracles. Donors Choose is also a good option for helping children give through a gift card. You can give them a small gift card and then help them choose classroom projects throughout the US to support. Last week my husband and I took our two boys, ages 3 and 1.5, shopping for toys and goodies to send to a missionary family our church supports in Baffin Island, Canada (almost as far north as you can go!). The family has five children and some right around our sons’ ages so we let them help pick out the trucks and cars and coloring books we were going to send. While we were shopping we let our 3 year old carry the prayer card picture so he could be reminded who all this was for. When we got home we all packed it together as a family, made cards and taped the box up. The next day we went to the post office to have it weighed and shipped. The whole time we were telling our sons who this was for and how it would make them all so excited to receive a package in time for Christmas. My 3 year old still talks about it and is looking forward to skyping with the missionaries once they receive their package. It was very exciting for all of us to be giving in such a fun, sacrificial (shipping cost $90…) way. Operation Christmas Child boxes are always so much fun for my kids to fill. Also, this year we made a list of chores for the kids with differing earning amounts but rather than getting that money themselves they chose where to “spend” the money in the Samaritan’s Purse catalog, which lists needs with many different amounts, including small amounts. (I know World Vision has a similar catalog.) They had fun thinking about how they wanted to spend/give their money and each of my three made their own unique choices. It’s fun to give and they are starting to feel that more with every giving opportunity. Wow, those are great ideas–thank you for sharing them! I especially love the third one. Children do love to shop & they love to give! Thank you. I like the gift card idea. For slightly older kids, adding up the things they want to buy to make sure the amount doesn’t exceed the gift card value would be good math practice too. My children’s school started a Christmas shop a couple of years ago. Parents donate stuff they don’t want or need anymore (clutter) and then the children get to shop for presents for other people. Everything is priced $.25 to $1, and all proceeds go to the local food pantry. This years goal was to raise $600, they actually raised just over $1000. Thanks for the suggestion, Gwen! That’s a great way to handle toy clutter, too. I think that I had more in mind the numerous organizations at this time of year that seek new, unopened toys to provide as gifts to needy children. Either way, it’s wonderful to give to your community. I didn’t think there were many new ideas out there to be had but these were all great! My kids are 3 and I would like to try some of these starting now and make them traditions that are just something we do. Thanks for this awesome series!! We did an advent calendar this year where every day we did something for someone else – everything from making ornaments to give to friends, to singing at a nursing home, to buying some ducks and chickens for hungry families through World Vision. One of our favorites (that helped de-clutter) was going through our stuffed animals to pick some to donate to Stuffed Animals for Emergencies (S.A.F.E.) http://www.stuffedanimalsforemergencies.org/. I was a little nervous about how my twin 3 year olds would do giving their toys away, but once I explained (at their level) what it was for, they were more than generous! You’re absolutely right. 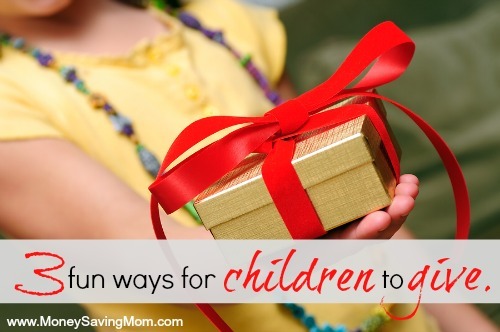 Kids do have giving spirits – they don’t always get credit for that either! This is a great time of year to show them *how* they can give back to the community, even in the little ways. There are opportunities all around us.